Third generation silicone cellphone pad holder provides convenient placement of your cellphone, glasses, and other devices while driving. Cleans easily with water and stickiness quickly re-energizes with alcohol wipes. This third generation silicone cellphone holder will provide convenient service for years to come. Dash board mounts for i-phone s-7 accessories, with anti-slip for mobile cell including Samsung galaxy; the smart choice for mobile phone mat. Friendlier ergonomic car dash pad design, for a safer and more pleasant drive. A more stable five point sticky silicone feet that won't melt due to temperature increase from the sun's rays. This cell phone mount stays in place even during sharp turns at speed. The vertical rubber holders are more ruggedly constructed to fit and hold nearly all smartphones including iPhone and Samsung cellular phones; whether they are enclosed in their phone cases or not. Now able to securely hold your cell phone in both landscape and portrait orientations. And at a slight 90% angle to minimize reflected light from the sun. This sticky silicone car mat pad can hold your phone securely on your car dash for a safe and enjoyable drive; providing you with a stable dash mat to mount your phone, GPS devices or sunglasses. This silicon dash mat Can hold your phone on kitchen table or desk for hands free video viewing and talking. Clean simple ergonomic designed cell phone mount can be taken anywhere for use at home or the office. LOGO FREE | We forego adding a logo to this beautiful heads-up cell phone holder for cars so that it fits more naturally within your vehicle's interior. NEW VERSION WITH INCREASED STABILITY | This car phone mount features five (5) sticky round silicone pads at bottom to prevent sliding even during sharp turns or acceleration. 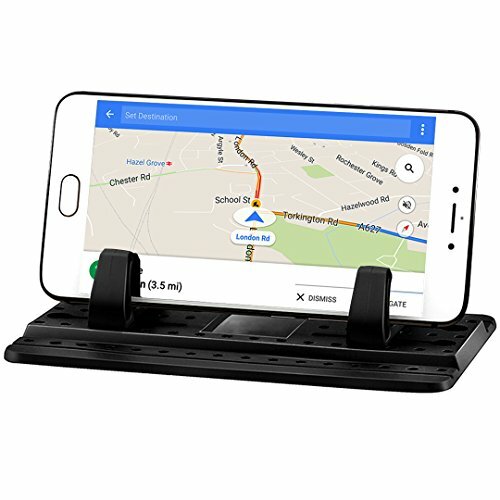 BETTER VISIBILITY DURING DRIVING | This car mount for cell phone holds your smartphone in place, in either landscape or portrait mode. Angled at approximately 90 degrees so that phone screen won't reflect light and obscure the screen. THICKER RUBBER HOLDER | This cell phone car mount is outfitted with a pair of rubber holders that fit nearly all smartphones. Holding smartphones with diagonal screens from 4" to 7" with or without their protective case. QUALITY SILICONE MATERIAL | This dashboard cell phone holder is strong enough to stay put while you adjust the rubber holders to fit your phone; and you can readily re-energize its stickiness by cleaning the underlying feet with alcohol wipes. Sized 15.8cm (6.22") X 10.6cm (4.17"), this 3rd generation silicone pad cellphone holder car is small and light enough to fit almost anywhere whether car dash or your office desktop. If you have any questions about this product by Gekko, contact us by completing and submitting the form below. If you are looking for a specif part number, please include it with your message.